A collection of about fifteen different children's stories. All the stories have a humorous twist to them. 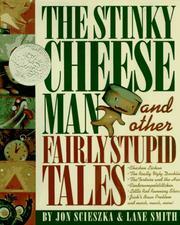 Scieszka, Jon//Smith, Lane, “The stinky cheese man and other fairly stupid tales,” Children's Picture Book Database at Miami University, accessed April 20, 2019, https://dlp.lib.miamioh.edu/picturebook/items/show/9749.